Shaitan The Advisor is the boss of the Lair of Shaitan. Shaitan, the first of these Mini Dungeon Bosses, is Oryx’s advisor and personal confidant. While slightly insane himself, Shaitan is King of the Djinn that roam the mountains of the Realm. Though disembodied, he lives his life in the ever-changing state of fire, a reminder to those who would cross him or take him as an ally. Be wary of this foe, as he is formidable and dangerous. Shaitan is the sole inhabitant of the Lair of Shaitan. His chamber consists of an island of walkable tiles in Magma, the top half of which of which his movement is restricted to. When a player first enters his lair, Shaitan will slowly emerge from the lava with both his hands. He will provide some dialogue for a few seconds before attacking. This boss is broken into 3 main phases. During this phase the Hands of Shaitan will fire waves of white bullets before chasing the nearest players while firing omnidirectional paralyze bullets and occasional aimed purple shots. They will try to “grip” players by sitting on them and keeping them immobilized. Shaitan will also occasionally spawn Creepy Small Heads which, paired with the paralyzing hands, can be deadly. Shaitan also occasionally fires purple armor-piercing bullets during this phase. The number of bullets his head fires at once and the number of Creepy Small Heads he summons at once increase as his HP is lowered. An interesting fact to note is if a player attempts to inflict a status effect on one of the Hands of Shaitan while they are chasing players, it will perform a unique taunt and return to Shaitan immediately. This can be beneficial or detrimental depending on the situation, but note that it does not apply to Slows. After chasing players for a bit, the hands will return to him and the phase will repeat. He will enter his vulnerable phase after the paralyze hands are killed for the first time - but for every repeat after this, he will enter his Silence phase instead. Silence hands will spawn on each side of Shaitan immediately after he re-appears in the middle of the arena. 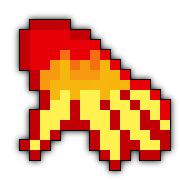 These hands act like homing missiles and ‘launch’ towards the nearest character and explode in a burst of Quiet bullets once reaching the point that the nearest character was upon ‘launching’. 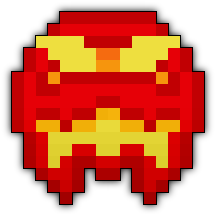 His head will also rapidly throw golden bombs that temporarily transform tiles into Magma, as well as spawn in a number of Creepy Small Heads. The amount of lava and minions increases as Shaitan loses HP. Because of the HP thresholds that this phase deals with, this attack will only be done at most 3 times during his fight (once at 3/4 HP, once at 1/2, and once at 1/4). Every time he does this phase, he will provide a unique taunt. After firing his hands a few times, he will enter his Vulnerable phase. Shaitan will become vulnerable, duck under the lava and move to the far right side of the arena. Upon surfacing he will shoot a two large spreads of armor-piercing shots in the direction of the nearest player. He will then submerge and move to the middle, then to the far left side of the arena, following this same pattern. After submerging the third time, Shaitan will then re-appear in the middle of the arena and enter his Paralyze phase. If he loses a quarter of his HP during this phase, however, he will immediately stop the phase and transition to his Silence phase. A large number of Creepy Small Hands will spawn from the lava during this phase. Once his head has reached critical HP, Shaitan will stop moving and explode into a ring of purple bullets. Minions will stop spawning and a Test Chest will appear at the edge of the walkable floor to grant you your loot. Please note that this boss spawns a Test Chest moments upon death in which you destroy to drop these items. Try to avoid the minions that spawn, as they will go over you and explode, causing large amounts of damage to your character, which will result in great pain or death. The fight space is very small, making it very hard to dodge his attacks. It is best to bring a large group along so the hands can be quickly killed, allowing players to hit Shaitan. In his vulnerable phase, Shaitan will sink below the lava and reappear somewhere else, immediately firing a few waves of powerful shots. Due to the fixed damage, they are not tankable. A good way to avoid experiencing this unpleasant surprise is to have shadows on for this dungeon. A glitch allows his shadow to appear even while invisible, and this can be used to track him.